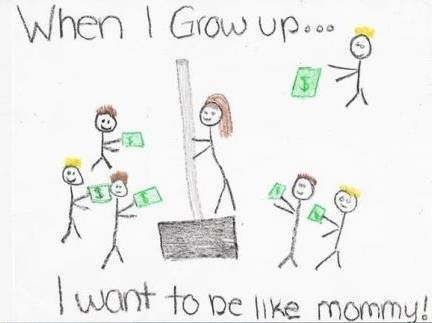 I want to be perfectly clear on my child's homework illustration. It is NOT of me on a dance pole on a stage in a strip joint surrounded by male customers with money. Unfortunately, I don't know who to credit with the e-mail, so if anyone knows the author, let me know. And, on the subject of not knowing who to give credit for their writing, remember the post "How to Awaken a Teenager"? The author ran across my post and let me know it is her work! The author of that post is Laurie at Manic Motherhood. Go visit her! You'll be glad you did! I love that email! I laughed so hard when I read it the first time. So typical of a child. I'm always twisting my words, as do my sibs. I think one or two of my kiddos are starting to do this now. My maiden name was Story. My sister calls this the Story dyslexia. I couldn't see the picture but it could be my computer which is acting up in odd ways lately. wuh-woh : ) I can appreciate some Speech Therapy humor too! cute email story!!! LOL! can you imagine!! glad you had a good day yesterday to just enjoy it for yourself! my grand-nephew when he was young mixed "f" and "s". So imagine what it would be when he asked someone if they wanted to play soccer. hoping today is a good one! Well, I've never heard this, so I definitely enjoyed a big laugh and I always enjoy laughing. but thanks for stopping by earlier. Feel free to use the word "gritched" -- I just hate putting curse words on my blog, so I tried to find something that worked. It's a cross between griped and ...well, you know. My mom used to say it. That is so funny. How humiliating for the mom of the little girl!